Berry Patch: Grow strawberries again? Should I plant another bed? Decisions, decisions, decisions. For 10 years or so I’ve grown strawberries here at Meadow Glenn. Three years ago, when the last planting petered out after five or six years, I started thinking about planting a new bed. I missed having our own strawberries, but I thought of two reasons why I shouldn’t replant. First, fresh strawberries are available at food stores almost every day now from California, Florida, and even Chile and Argentina. And second, strawberries seem to grow closer to the ground than when I was younger—with my Aching Back reminding me of that curiosity of plant evolution. But I also thought of several reasons why I should plant another bed. Store-bought strawberries—like store-bought tomatoes—are tough specimens designed for long trips to markets, and it seems to me they just don’t taste like those that you pick 20 feet from the kitchen door. Also, most store-bought fruit is sprayed with who-only-knows-what pesticides, fungicides, and whatever-else-cides—and I can absolutely control what I spray on my own strawberries—including no spray at all. Six of one, half dozen of the other—or was that two sides of the same coin? Well, it was decision-making time. “Ellen, do you think I should order some strawberry plants?” I outlined the arguments for her. My ultimate decider had decided. 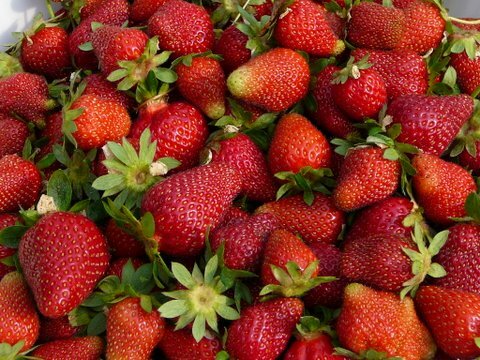 But which of the scores of strawberry varieties should I buy—June-bearing or everbearing?—early season, early midseason, late midseason, late season? My first stop was to check out the strawberry information tucked here and there in the “Small Fruits” chapter of the “University of Maryland Extension Master Gardener Handbook.” And then I found a helpful website featuring loads of information just about strawberries: strawberryplants.org, which identifies itself as “The ONE stop for EVERYTHING related to strawberry plants and growing strawberries.” Yes, they do SHOUT on that site, but I read and made notes. I decided to order June-bearing plants, rather than the newer—at least to me—everbearing. A June-bearing variety produces more fruit over about a two-week period, while the everbearing varieties bear fewer fruit but over the whole summer basically. June-bearing plants generally are allowed to expand into narrow beds, while everbearing plants generally are hilled and require more attention. Everbearing plants, if you think about it, are probably the reason we have fresh strawberries year-round. Every day they’re blooming and producing fruit somewhere in the world. The strawberryplants website also had a useful chart showing the overlap of the various categories of June-bearing plants, such as “early season” and “late midseason.” Since plants generally come in bundles of 25, should I order 25 early- season plants and 25 late-season plants so I might be picking fresh strawberries for about three weeks? At that point, my Aching Back became a factor. Stooping to pick strawberries is one thing, but standing back up sometimes is another. I went to the garden and surveyed possible planting sites. If I plant along the high walls of our raised-bed terraces, I can sit on the concrete blocks and pick with minimum stooping or bending. A quick look at those areas convinced me that 25 plants would be plenty. But what variety? I had looked at the recommendations in the “Handbook,” and the strawberryplants site listed varieties recommended by various state agencies. When I was thinking two varieties, I had settled on 25 Earliglow, which would fruit from Day 1 to 12 of the season and 25 Allstar, which would fruit from Day 10 to 22. Since I have room for only 25 plants, I decided to order the Allstar variety because that variety will bloom later and be less threatened by late frost. Where to order? I went back to the strawberryplants site again and learned that Allstar plants are available from 24 listed retailers. I ordered from Indiana Berry & Plant Co. for the irrational reason that the company name sounds like a good place to order strawberry plants. My bundle of 25 Allstar plants cost $16.50 plus $10.00 shipping. I received an email from Indiana Berries saying the plants would ship March 28. They arrived March 30. The driver gave a quizzical look at the box as he handed it to me. Since I wasn’t going to plant them for several days, I put the box into the refrigerator to help keep them dormant. In my next posting, I’ll show you the bundle of 25 Allstar plants—and tell you why I planted them the way I did. If you want more information about growing strawberries, I suggest you take a look at the “Strawberryplants.org” website. CLICK HERE. If you want to look at the Indiana Berry & Plant Co. website, where you can browse online or order a catalog, CLICK HERE. To check out the University of Maryland Extension’s Publication HG68,” Getting Started with Small Fruits,” CLICK HERE. Glad you posted this . It redinded me that I have strawberry plants in my frig that I forgot about !! I used to know the strawberry breeders at the USDA and their favorite variety for this region was always “earliglow”. Tiny berries that pack a HUGE punch! But as the name says, they are an early june-bearing variety. Just remember that a strawberry that has been bred for California's climate/soil may not taste as good as one that has been bred for this region, so try to find varieties for the Midatlantic. The strawberryplants.org site you listed is a great reference! Thanks! Great minds think alike and I have grandchildren that are low to the ground and don't mind picking strawberries. I ordered 100 plants this year 25 each of earliglow, darselect, sparkle and an everberring variety called portola. I've laid drip tube in the bed and will use a matted row system for the june bearing strawberries. With the dry late March and early April we have had, the drip has been a god send and the berries have a couple of leaves on them and are looking good. I'll send you a couple of pictures of my bed and keep you informed on how the project is going.